Today we are dedicating the day to baking cookies. I already made dough last Sunday, whew, what a good idea. Glad I was actually thinking for once. With the premade dough the hard part is over and the fun part is for today. The plan is to to bake date pinwheels. 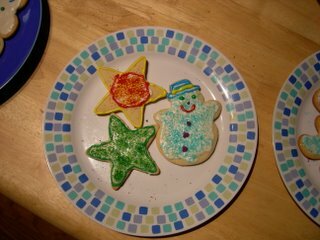 Those cookies were so hard for me to make, the dough was not very cooperative. I do hope they hold up and produce a decent cookie as these are Keith's favorite. He has been begging me to make a few, his mouth is watering thinking about eating them. We will bake and decorate sugar cookies thanks to great-grandma Wolf's awesome yummy recipe. The best sugar cookies ever. So we've got to roll them out and add "lots of sprinkles" according to the children. There are so many cookie cutters that there should be a nice variety of shapes. And of course we need to make a few especially for Santa. I had intended to make the special most delicious cookies I know but those take a ton of time and are so delicate that really I have to make them when I have the kitchen to myself. Maybe I can work them out tomorrow, it's just not Christmas without great-grandma Stekli's Hungarian butter cookies. Enough writing off to the kitchen I go. I'll bake and take pictures, maybe if they aren't all gone before I find the camera.